Take one bowl and pile on your favorite ingredients. Pour on 5-6 ladles of our Signature Sauces. Be as bold and creative as you want to be! Watch as our skilled grill warriors cook your meal to perfection on our gigantic grill. Eat and repeat. It’s unlimited so go back and try something new or stick with your go-to recipe. 60 ingredients. Thousands of combinations. You decide. Prices vary by location. Find your local HuHot menu. Cheesecake-filled rangoons served with ice cream and choice of topping. Hot fudge flows from this moist chocolate cake; served with ice cream. 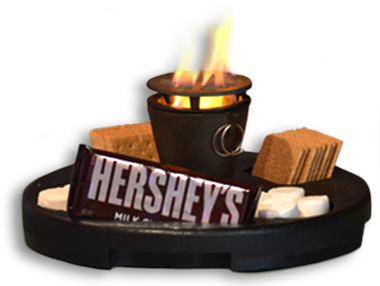 Traditional S’mores at your table with your own campfire – enough for at least two! Mixed greens with veggies, mandarin oranges, toasted noodles and our famous Asian vinaigrette. Mixed greens topped with teriyaki chicken, toasted noodles, almonds, tomatoes, mandarin oranges, broccoli, scallions, and our Asian vinaigrette. We also offer beer, wine, saké, hot tea, coffee and milk at most locations. Contact your Local HuHot for more details. Grill meals for ages 3 and under are FREE! Kids Grill Meal Includes rice. Many locations offer a weekly Kids Night special. *Check availability in your area.